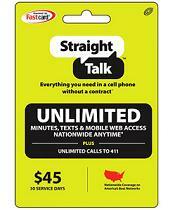 Straight Talk offers prepaid wireless plans for people who do not want to be locked into a contract. All you have to do is buy a phone, purchase a plan that suits your needs and then activate it. I was interested in Straight Talk because I spend a lot of time in the US. It costs me a fortune to use my Canadian cell phone in the US. Straight Talk offers a plan that looks too good to be true. It is $45 a month for unlimited talk, text and data with no contract. You can purchase it at Walmart or on their website. That plan is better than the one I have on my Canadian phone with Fido. So I decided that I could buy myself another iPhone and get the unlimited plan for $45 a month to use while in the US. Before I did that I researched online a bit and found that a lot of people were having issues with the “unlimited data”. I found reports that Straight Talk throttled data. In case you are unfamiliar with throttling data, it means that Straight Talk might limit, or throttle, the rate at which it accepts data, in order to avoid overloading its processing capacity. I decided to talk matters into my own hands and email Straight Talk directly about their unlimited data. Below is the correspondence with them. I am interested in switching to Straight Talk and have a few questions that I can’t find straight answers to on your website. I would like to get an iphone to use with Straight Talk and I know I can buy them at Walmart to use with Straight Talk. I’ve read online that there are restrictions for iPhones and that the data is not truly unlimited and that you could cut my service off at any second without notice. I also read that I cannot steam movies onto my iPhone such as Netflix or watch YouTube. Thank you for your interest in Straight Talk Wireless. We are responding to your recent inquiry. Please be informed that when using Straight Talk Unlimited Service Plans, you will enjoy the benefits of unlimited calls, unlimited text messaging and unlimited browsing. However, there must be limitations when using your data access. Straight Talk reserves the right to cancel or deactivate your service if our system detects that there is an improper usage of your Unlimited Service Plan. Furthermore, we will be sending you a text message in order for us to warn you with your data usage. If we verified that your phone has been using your data access excessively even after we warned you with it, there is a possibility that all the features of your phone will be canceled or deactivated. Moreover, we currently do not have the specific limit for data usage. This kind of usage will have a great impact on the carrier’s network and service level and may result into system issues. Moreover, there will be no guarantee that you can access all data feature of the phone. If you have any further questions or concerns, please contact one of our customer care representatives at 1-888-251-8164. For your convenience, our representatives are available Monday-Sunday from 8:00 AM to 11:45 PM EST. Thank you for being a Straight Talk Wireless customer. We appreciate your business. After reading the response from Straight Talk I decided not to go through with purchasing a iPhone and using their unlimited plans. They clearly stated that they could terminate my service at anytime if I use the data too much. Why do they claim it is unlimited data if it really isn’t? To me that is straight up false advertising! I decided just to get a cheap, prepaid phone from AT&T for now and it works just fine. I didn’t want to waste my money on buying a compatible iPhone to use with Straight Talk and then them cut me off. I don’t really use much data on my phone but it is the whole fact about the false “unlimited data” that ultimately steered me away from chosing to use Straight Talk. Are you a Straight Talk customer? Do you have any problems with them throttling your data? Let me know in the comments below. I’ve been liking the AT&T GoPhone so far. It is good for me cause I spend a lot of time in the states and I can just load it up everytime I am here. $25 for a month of unlimited text and 200 minutes. Then there are a lot of other add-ons you can get.